Construction on the new bridge is now estimated to be completed by August 2019, approximately 10 months later than originally scheduled. The project was initially slated to finish up by this fall. St. Martin said the steel fabricator for the project, High Steel Structures LLC, informed RIDOT last spring the steel for the $21.9 million bridge that is part of redeveloping the former Interstate 195 land could not be fabricated due to discrepancies in the bridge plans. The fabricator then had to go back and work with the contractor, Daniel O’Connell’s Sons, and designer, CDR Maguire, to correct it. That process took from April 2017 until December 2017, St. Martin said in an email. That’s Crazy because the bridge span is complete with the surface decking already halfway completed. Its still under construction as we speak. Someone figure it out over there. That is madness. But then again, I thought that $21 million for a pedestrian bridge was madness, as well. $21 million for a steel structure for people to walk across. Crazy. I have walked by this bridge almost every day since construction has started. It has been a running joke amongst my friends that it will never be completed. We always wondered what the heck was taking so long. This is unacceptable. Wexford is going to be complete before this pedestrian bridge is open. 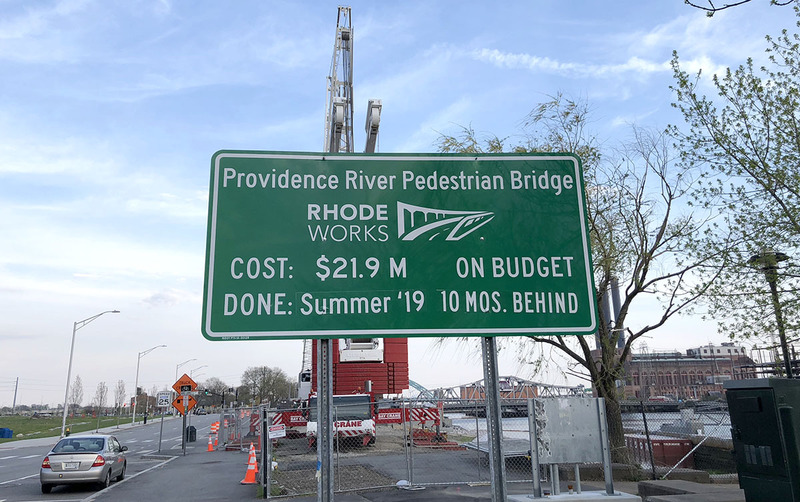 Former Mayor David Cicilline and former Director of Planning Thom Deller are responsible for the debacle of a competition that resulted in this $5m pedestrian bridge becoming a $22m pedestrian bridge that has taken 8 years to build … and counting. This was a rigged competition where the jury selection was overturned by the politicos and the results speak for themselves. Everyone won except the people of the city who worked hard on the idea to have a bridge and those of us who would have been able to use it daily if it had been built as promised years ago. The “designers” CDR Maguire are the same Maguire Group that filed for bankruptcy leading the 195 relocation engineering. (http://www.providencejournal.com/article/20111107/news/311079986). There is not a lot to feel good about here. When it is done, this overly scaled bridge is going to look like an aircraft carrier wedged across the Providence River.